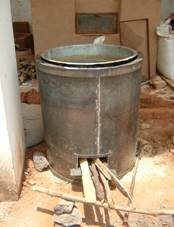 In Uganda over 94% of the energy consumed is obtained from biomass. Most of the biomass energy consumed is utilized in households for cooking and currently, acres of valuable ecological resource are going up in smoke at the rate of 240 million tones per year (NEMA 2001) and the traditional 3 stone fire (characterized by a very low efficiency) is the main cooking device used. Therefore it is of great urgency to focus attention and promote more efficient cooking devices in order to minimize losses hence reducing the rapidly increasing biomass energy demand. For this reason, one of the specific objectives of the Energy Policy for Uganda is to improve the efficiency in the use of biomass resources recognizing that biomass will remain a dominant source of energy for the foreseeable future. 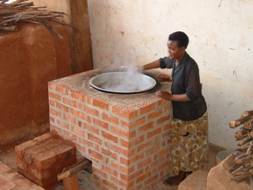 To achieve this effectively, the Ministry of Energy and Mineral Development intends to develop and carry out scientific testing of various cookstove and kiln designs in order to come up with the most efficient ones to be recommended for dissemination to the communities. This exercise is to be carried out in collaboration with the Uganda Industrial research Institute which among other things will provide the space where the experiments will be conducted. The length of contract will be for 3 weeks, from Aug 15th to Sept 7th. To fire insulated bricks with Pumice/clay and vermiculite/clay and sawdust/clay, develop a number of prototypes with fired and unfired mixtures for the market rocket stove, and meet with local stove-building partners. At the end of the first week, the stoves will be demonstrated to a group of women with the help of NGO partners. The stoves will then be placed in people's homes in the peri-urban areas around Kampala, preferably in places where people are using a mixture of charcoal and wood. These stoves will then be monitored. To improve the bread oven, the institutional stove and the single pot commercial Rocket. · Improve the market stove (per the women’s recommendations from the demonstration) and the insulative mix. 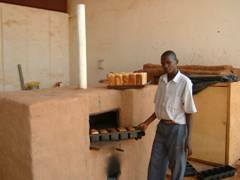 · Visit institutional stoves in schools built by Mr George Sizoomu and Mr Kawere Muhammad and improve them. · Based on the new Aprovecho prototype of an improved (insulative) Lorena stove, improve the existing one and build an improved one at the research center and then one in the field. · Meet with the women who are beta testing the stove to garner their further impressions and find out if the stove is suitable to their cooking task. If not the stove can be modified and then returned to them ASAP. One 2-pot Sunken Rocket stove with built in skirt. 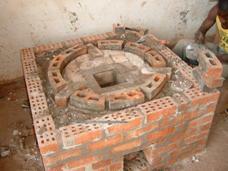 Five 200L institutional stoves were constructed at Musa Body University of Technology. 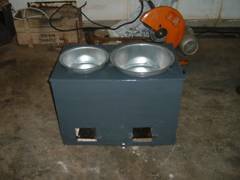 These stoves, which will be constructed by Kawere Muhammad, were the first of thirty that were ordered by the UPDF. 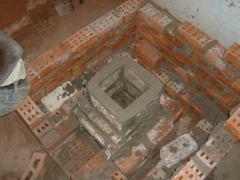 Two 100L portable metal and insulated brick institutional stoves were constructed. 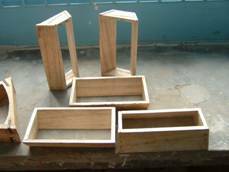 One of these was an initial prototype constructed at George Sizoomu shop at Kirinya-Bweyogerere as part of a one-day training. The second (shown here) was built at Musa’s university of technology in cooperation with Kawere Muhammad. 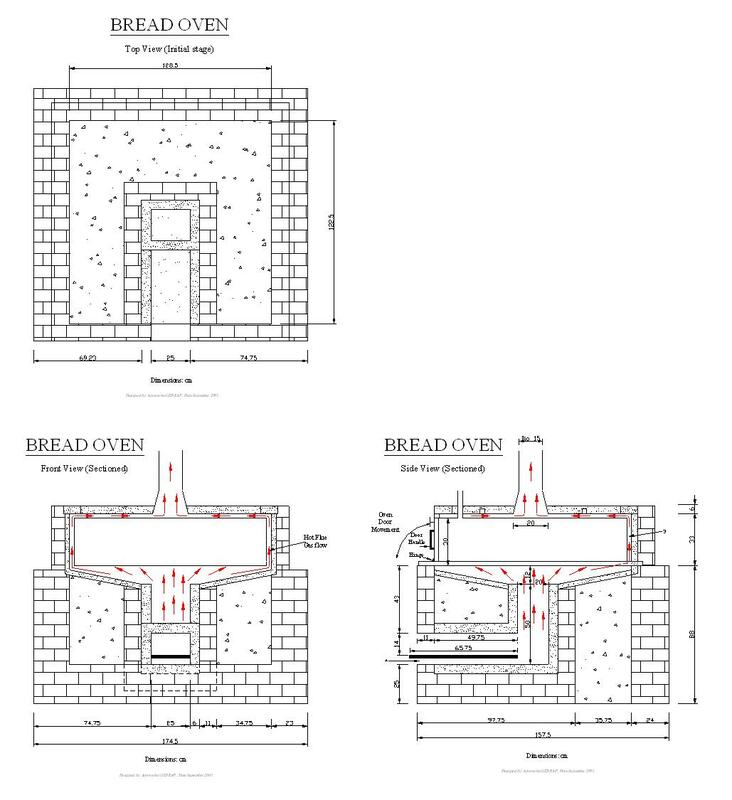 One 75-loaf bread oven was designed and constructed. At the end of the contract only cosmetic finishing touches were necessary for full completion of the oven. 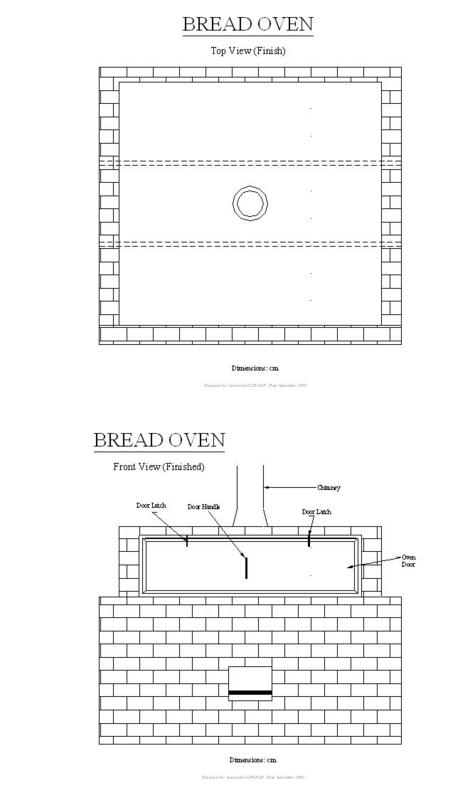 Before arrival, the consultant produced plans for a Rocket bread oven that was then built and tested by GTZ/UIRI. Over 50 insulated test bricks were fired in Cooperation with George Sizoomu and Francis Sebabi at the Department of Industrial Ceramic / Uganda Polytechnic Kyambogo/ Kyambogo University. Four single pot Rocket stoves were produced using Vernacular Insulative Ceramic (VIC). 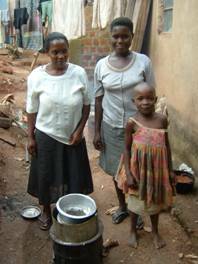 Three women were selected to use the stoves for a week. GTZ-EAP’s telephone number was given to the selected women and it was explained that they could contact us toll free at anytime if they were faced with problems with their demonstration stove. 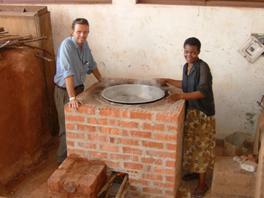 On Sept 10th, 2003 we visited the three houses where the stoves had been placed during the previous week. Unfortunately, we were not able to connect with Frank Ssentongo so we couldn’t plan the visits ahead of time so we ended up arriving a few days later than scheduled. Although a surprise visit is a good way of assessing if the stove is being used (Quick! light the fire, the mzungus are coming!) it is not ideal for eliciting coherent information from the participants. The participant that was selected during the workshop, Mrs. Mutaisa, was not at home so we interviewed the maid instead. She seemed a little uncertain, or perhaps a little shy, in regards to discussing the cooking situation. 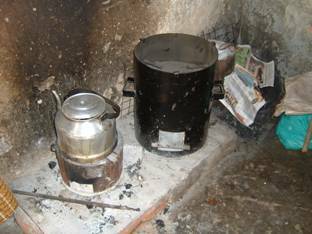 The Rocket stove was not in use when we arrived but the maid of the house assured us that the stove was being used frequently. She said that she was only now using charcoal today because she had run out of wood. Under normal circumstances she said that she would use about 150 shillings worth of wood per day (for approx 8 people) compared to approx. 300 Ush per day for charcoal. At the end of the visit we took the stove to a local metal shop to make some adjustments to the skirt and the pot stand. The stove was then returned to the house. As mentioned earlier, the women responsible for the stove was not present during our visit so another visit would be highly recommended. At the second house that we visited the participant that was selected during the workshop was also not at home but we found the stove in use outside of the house. It was explained to us that the recipient was sharing the stove. The woman who was cooking was very pleased with the stove. In fact when we suggested that we take the stove for the day – to make a few changes – she appeared very unhappy. She commented that the stove was cooking food very quickly and saving a considerable amount of fuel - roughly 60-80% less than the traditional stove. She said that her fuel costs had been reduced from 500 Ush /day to approx 100 Ush/day. This, however, is only when she buys firewood, which is not everyday). She said that there was nothing that she would change about the stove and that it was a great to benefit to her family. This is the only woman who faced serious problems with her stove. 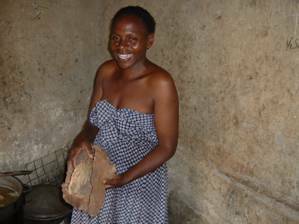 After cooking at her house for a few days, she was convinced that the stove could not cook traditional foods such as Matooke. When we went to her house we realized that the stove was still wet from the mortar. The insulative bricks absorb a lot of moisture during the construction process and take some time to dry. We explained this to her and donated some firewood to her for the purpose of drying out the stove. 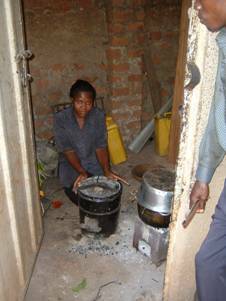 A few days later she traveled to UIRI to tell us how pleased she was about the effectiveness of the stove. It was able to cook a 35 cm diameter saucepan full of Matooke in only 35 minutes. She also said that the stove was able to cook a large pot of dry unsoaked beans in 2 hours and 45 minutes with only 2 pieces of wood (approx 6cm in diameter by 60cm in length). She said that this was about 20% of the wood that she would normally use to accomplish such a task. Below is a visual comparison of the amount of fuel that she used to cook one pot of unsoaked dry beans before and after the introduction of the single pot sunken rocket stove. 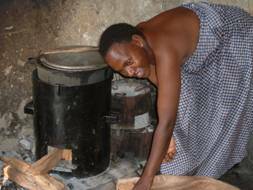 These brief visits suggest that women who are aware of fuel costs or a faced with severe fuel shortages due to cost or availability are open to switching from charcoal to wood. 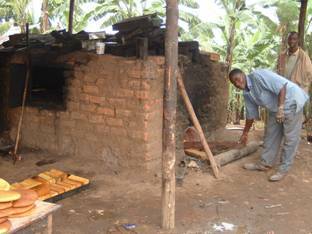 Any commercial cookstove program should be targeting these people, as they will see the greatest benefit of the stove. 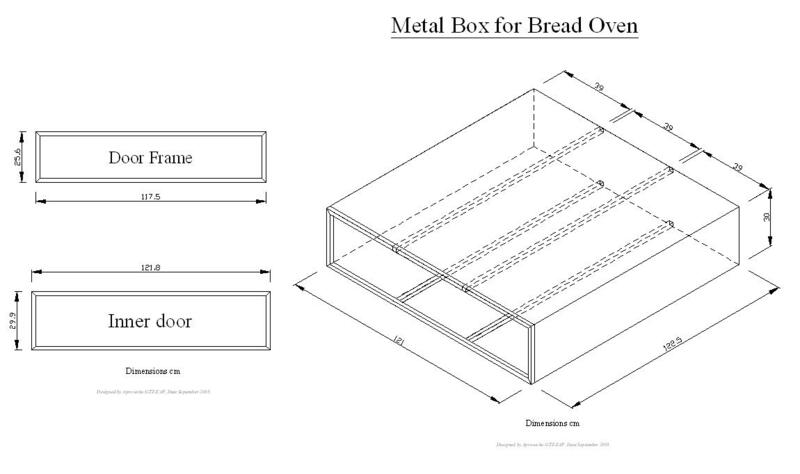 The rocket bread oven features a 120 cm by 120cm by 30 cm baking compartment made from 2.5 and 1.5 mm sheet metal. The combustion chamber and the area that encompasses the baking compartment were constructed with VIC bricks (see ceramic section for more details) and cut pumice brick. The first model was designed by Peter Scott and built by GTZ and UIRI in May 2003. UIRI staff tested the bread oven and found that it was able to cook 17 kg of bread with only 5 kg of dry wood. This was a considerable reduction in wood consumption as compared to the traditional wood fired bread oven that consumed 200 kg to bake the same quantity of bread. Even though this first prototype was built around Rocket principles there were a few deviations from the original design. UIRI staff constructed the combustion chamber before the final plans arrived so they were forced to improvise some of the construction details. This led to a couple of small problems that could cause problems in the long term. As can be seen from photo 5.1, the area between the combustion chamber and the baking compartment is blackened with soot. This is a result from fire and smoke spilling out of the front of the stove. In a properly functioning stove, this area should be free of soot. (Obviously over time it is possible that careless cooks might allow fire to occasionally creep out of the front of the stove by leaving it unattended for long periods of time. This was obviously not the case as the stove was only fired a few times. The reason for this ‘back-firing’ was that the gap between the top of the combustion chamber and the baking compartment was not sufficient. The builders created a 3cm gap between the bottom, the sides, and the top of the baking compartment. A 3 cm gap along the sides and the top of the compartment is sufficient, but directly above the combustion chamber, a larger gap is needed (10-15 cm). Insufficient air entering the stove: this creates a ‘lazy’ looking fire in the combustion chamber that creeps back along the fuel and eventually travels out the front of the stove. In a Rocket Stove with proper draft the fire is ‘pulled’ up the combustion chamber. Increased smoke production The ‘lazy’ fire is a symbol that the combustion is not at a stochiometric optimum, which means more smoke is visible out of the chimney. Smoke coming out of a Rocket stove chimney is a symptom of a incorrectly functioning rocket stove. Not surprisingly, both of these situations were apparent when I observed the stove operating. The fire crept out of the front of the stove and a large amount of smoke was emitted from the chimney at the beginning of the fire. Eventually, as the oven heated up, more draft was created inside the stove, which increased the air flow into the combustion chamber closer to the stoichiometric rate, which led to a decrease in smoke production. One could argue (albeit erroneously) that the oven eventually functions effectively – smoke production decreases, the fire is pulled up the chamber and the fire begins to burn more vigorously. First, the poor combustion of the initial fire leads to increase soot production. This soot is then deposited around the baking compartment. This decreases heat transfer and means that maintenance and cleaning of the baking compartment must be performed more frequently. Cleaning the oven is time consuming and difficult. Secondly, placing the combustion chamber too close to the baking compartment creates a hot spot directly above the combustion chamber that burns the bread and eventually degrades the sheet metal. The entire baking compartment is now designed to be removed for maintenance, alteration and repair without damaging the structure of the oven. A hollow pipe connecting the baking compartment to the external environment to release excess steam. This pipe connects the baking compartment to the external environment. This can be opened and closed by the baker as needed. A slightly wider feed chamber (20cm tall by 25 cm wide) to accommodate the larger diameter pieces of wood that are used by traditional artisans. Insulated bricks and whole pumice block are used to insulate the combustion chamber and around the entire baking compartment. The oven body of the earlier design required more materials. As the cross section of the new prototype shows, the new model now only requires VIC and common brick for insulation. These insulated bricks should last indefinitely unlike the metal jacket that would have to be replaced periodically. If desired, the new design can also utilize the original brick- wood ash-metal matrix to insulate the oven. I would estimate that there is sufficient energy within the present combustion chamber to build a double layer-baking chamber. The existing oven body can be used and in fact the existing baking compartment can be used, as it only needs to be extended vertically by 15-30cm or enough to support a second tray of bread. The top can be cut off, raised up, and supported with three15-30 cm panels attached to the sides of the oven. Then a second baking door could be fitted on to the newly extended chamber. Tests should then be run to determine its new baking capacity. With this layout for the baking compartments, some modification of the gap between the baking compartments and the oven body will be necessary. This stove was built in cooperation with Kawere Muhammad and his stove mason Mande. *This accounting of the material costs shows that the majority of the cost of the stove (180,000 Ush) was for the purchase of high-fired Kajansi bricks. These bricks are valued for their strength and durability, which is important for those who are building institutional stoves commercially. However, their cost might put the stove out of reach for poorer institutions that want to build stoves on their own. 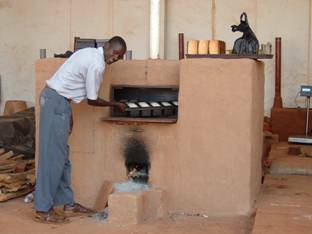 These stoves could be replaced with cheaper local mud bricks. I recommend that plans be drawn up to substitute cheaper local bricks that cost only 70 shillings each. The total cost for these bricks would be only 13,300USh thus lowering the cost of the stove by over 166,700 Ush. . The saucepan is sunken into the stove - only 3 cm (of the 36cm total saucepan height) is exposed above the edge of the stove. Note: Submerging the pot is extremely important for increasing the surface area exposed to the hot flue gases and maximizing heat transfer. The sides of this pot (height 35cm / diameter 63.5) have twice the surface area of the bottom of the saucepan. 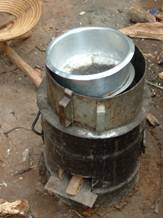 Only exposing the bottom of the pot to the hot flue gases (as shown in these so-called improved stoves from Masindi) decreases heat transfer and over all efficiency by 50%. 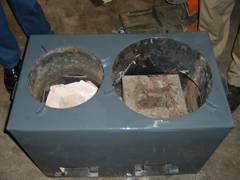 An insulated Rocket Stove combustion chamber. The rocket combustion chamber was constructed with an insulated ceramic brick produced by George Sizoomu This mixture contains equal parts by weight of Kaolin, stone dust, sawdust and bowl clay. It is fired at 1300C. 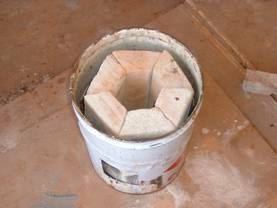 This particular mixture, while effective is more than is actually needed for the Rocket stove. The Rocket stove does not normally produce temperatures in excess of 900C. 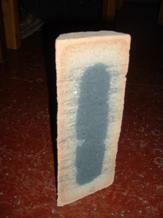 Other types of VIC brick or cut pumice blocks can be used instead. The above table demonstrates that the chimney decreases efficiency of the stove and that wet wood greatly decreases the time to boil. It should be noted that, as with all Water Boiling Tests, no lids were used. Obviously in a real cooking situation, where a lid should be used, the time to boil would be greatly reduced. We need to build the angle iron structure/top ring around the stove. We have already paid Kawere Muhammad for a properly sized metal top ring that rests on the brick skirt. We will need to hire someone to build the angle iron enclosure. I would recommend making it removable so that we can demonstrate the stove with and without the chimney. Put pot stabilizers in place. A chimney stove is, by nature, more difficult to build and maintain. For example, to accommodate the handles and allow for the easy removal of the saucepan it is necessary to leave a small gap between the skirt and the saucepan. This means that it is difficult to completely seal the top of the stove. Cool air can leak through this gap and this can decrease the effectiveness of the chimney. 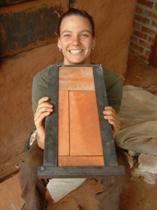 Finding a locally produced insulated brick is the cornerstone of any Rocket stove program. 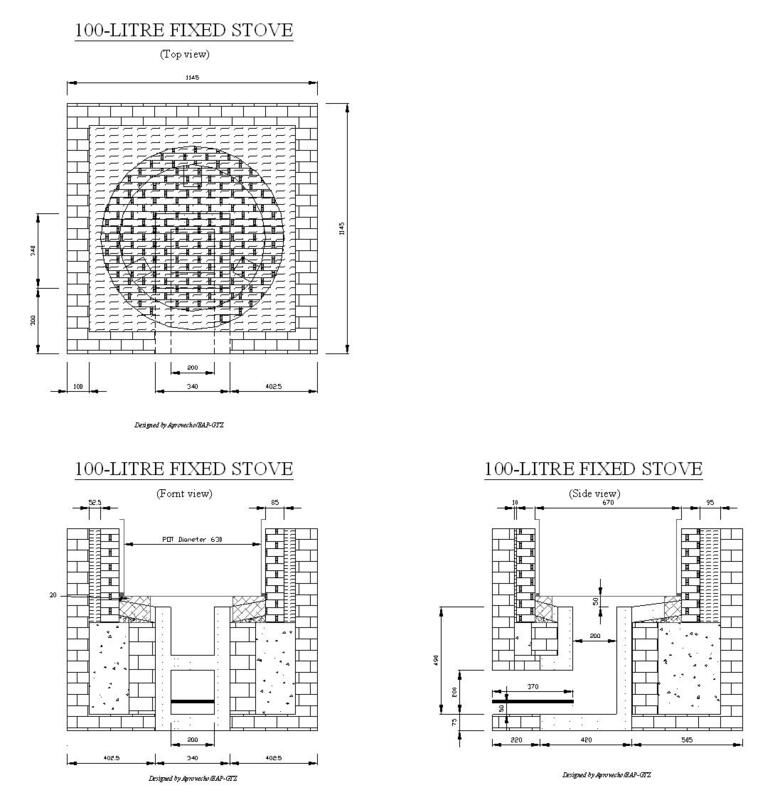 Attempting to copy the Rocket stove geometry without following the principles of insulation will result in a stove that could actually increase wood consumption compared to traditional or other improved stove designs. 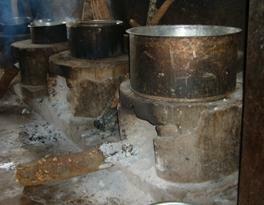 Emphasis must be placed on locating suitable materials before production of stoves begins in any region. Otherwise people might adopt the technology and use whatever materials are available regardless of their suitability. Insulation is not just important for increasing efficiency. 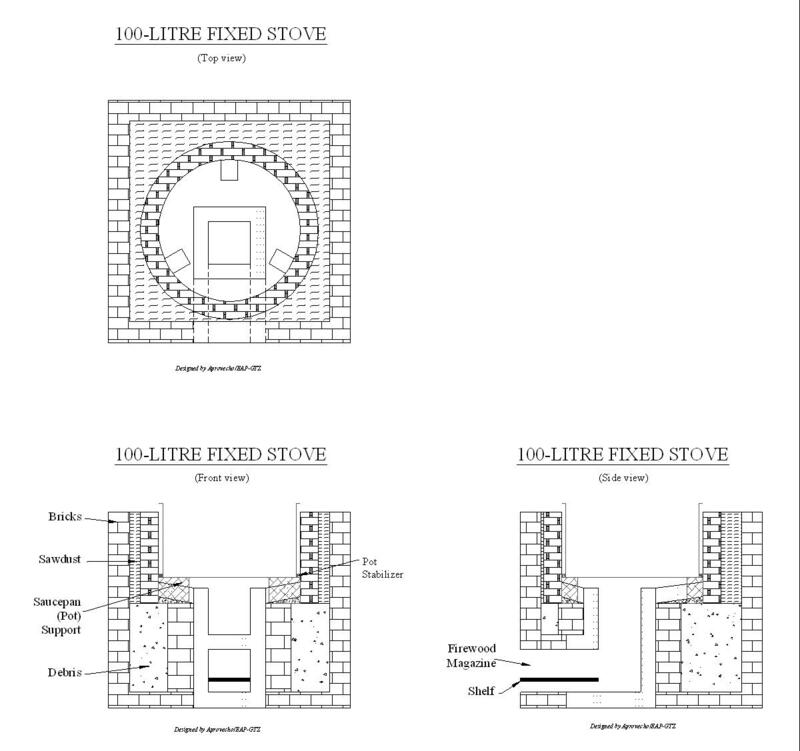 Highly insulated combustion chambers - as opposed to those only nominally insulated - increase efficiency, but more importantly, they reduce smoke production in the stove. 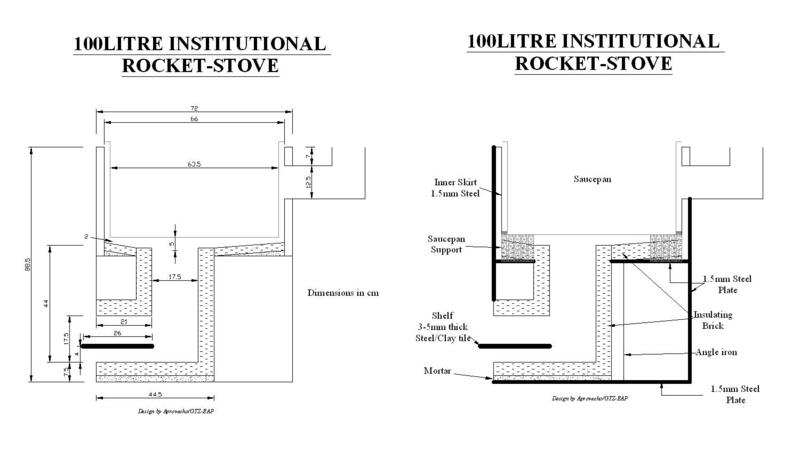 This is illustrates by the difference between the three improved LoRocket stoves. The difference in efficiency between the sawdust stove and the pumice stove is only approximately 2% but there is a significant reduction in visible smoke (as noted by Leonard) This focus on combustion is especially important when building stoves that do not have a chimney. The extra efficiency points that are noted are a result in an increase in Nominal combustion efficiency and this will have a profound effect on the users long-term health. This contradicts the school of thought that says its better to build 100,000 stoves at 20% then 30,000 stoves at 33% as the increase will not just increase fuel efficiency but will , more importantly, reduce IAP. During the contract period we focused on constructing charcoal and saw dust bricks (see attached appendix for brick densities and characteristics). The charcoal bricks were our first material choice because charcoal fines were thought to be a waste product and they formed a light and strong brick when fired. This Charcoal/clay brick (shown here) was artificially dried for 2 days at 250C and then fired for 24 hours in the electric kiln at 950C. This brick still has a large portion of charcoal remaining in the brick. The charcoal from the outer layer of the brick has been burnt away which has created a sufficient 3cm insulative barrier. The remaining charcoal has a low conductivity and improves the strength of the brick. Unfortunately this unburned charcoal clay adds considerable weight to the brick. It would obviously take a longer period of time (and more energy) in the kiln to burn all of the charcoal out of the bricks. More research has to be done on the effectiveness of longer fired charcoal bricks before they were introduced as a liner into a stove. The longer firing times, combined with the extra effort and energy to grind the charcoal into a fine powder make charcoal bricks a less than perfect option for VIC. 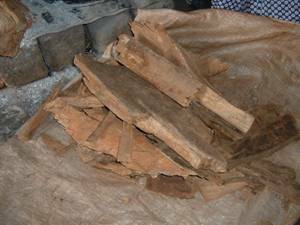 Sifted sawdust bricks – while still needing more research- seem to offer the best solution in the short term. 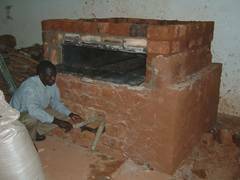 I would recommend focusing on sawdust bricks for the single pot stove and vermiculite bricks for the institutional stove. The bricks that we are using in Lesotho are about 80% medium vermiculite by volume and about 20% clay. Some of the test bricks that we fired in Uganda were with fine Vermiculite because we had not located the coarser vermiculite. This fine vermiculite has a very limited insulative aspect and is not recommended for the VIC brick. The above photo shows three different kinds of mica. 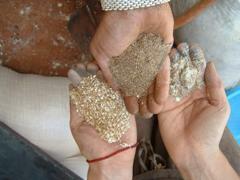 Starting at bottom left and moving clockwise the picture shows medium or coarse vermiculite, fine vermiculite and finally unprocessed mica. The ideal density of the bricks should be between .4 and .7 grams/cc. 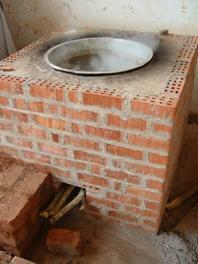 All bricks should be dried in the shade for at least 5 days and then fired in an electric or wood kiln for one day. Artificial drying is not necessary if sufficient natural drying is possible. The correct gap will depend on the size of the combustion chamber and the size of the saucepan or baking compartment. We will use our 20cm by 20 cm combustion chamber and our 100L pot as an example. First, calculate the cross sectional area of the opening of the combustion chamber. Assuming the combustion chamber is a 20 cm square then the total area is 20 cm *20cm or 400 cm2. This is the theoretical maximum cross sectional area that should always exist between the saucepan and the stove body. (Note: efficiencies can be increased by carefully reducing this gap. Conversely, construction limitations or cultural constraints might force the designer to widen this gap but knowing the “correct” gap is an important starting point). So the “correct” gap between the saucepan and directly above the combustion chamber is 5 cm. 2.83 cm is the correct gap between the saucepan and the stove body at any point 22.5 cm outward from the centre of the saucepan. This is the “correct” gap between the saucepan and the stove body at the edge   of the saucepan or any point that is 31.5 cm outward from the centre of saucepan. The three gap points under the saucepan (5cm, 2.83 cm, and 2.02cm) can be connected to form the “correct” slope under the saucepan. energy its heat loss to the exterior must also be minimized and the convective and radiant heat transfer to its pot must be optimised. 18.) Using a grate will often increase efficiency and may reduce emissions as well. 21.) Preheating incoming air may also improve the quality of combustion and the efficiency by raising average combustion chamber temperatures. · Its not true that where there is smoke there is fire; in truth, where there is smoke there is poor fire! Smoke coming out of the top of the stove? Too much wood in the stove. Pull some of the sticks out of the combustion chamber. There is insufficient draft. This is caused by the gap between the pot and the skirt or the pot and the combustion chamber being too small. This will result in increased smoke production, and a ‘lazy’ looking fire. Increase the gaps! The combustion chamber might be to short. Increase the height of the combustion chamber if you have altered it. Fire coming out of the front of the stove/feed chamber? The combustion chamber is overfilled with coals instruct users to clean after each firing. 1) Insulate, particularly the combustion chamber, with low mass, heat resistant materials in order to keep the fire as hot as possible and not to heat the higher mass of the stove body. 3 .) Heat only the fuel that is burning Burn the tips of sticks only as they enter the combustion chamber. The object is NOT to produce more gasses or charcoal than can be cleanly burned at the power level desired. 4.) Maintain a good air velocity through the fuel. 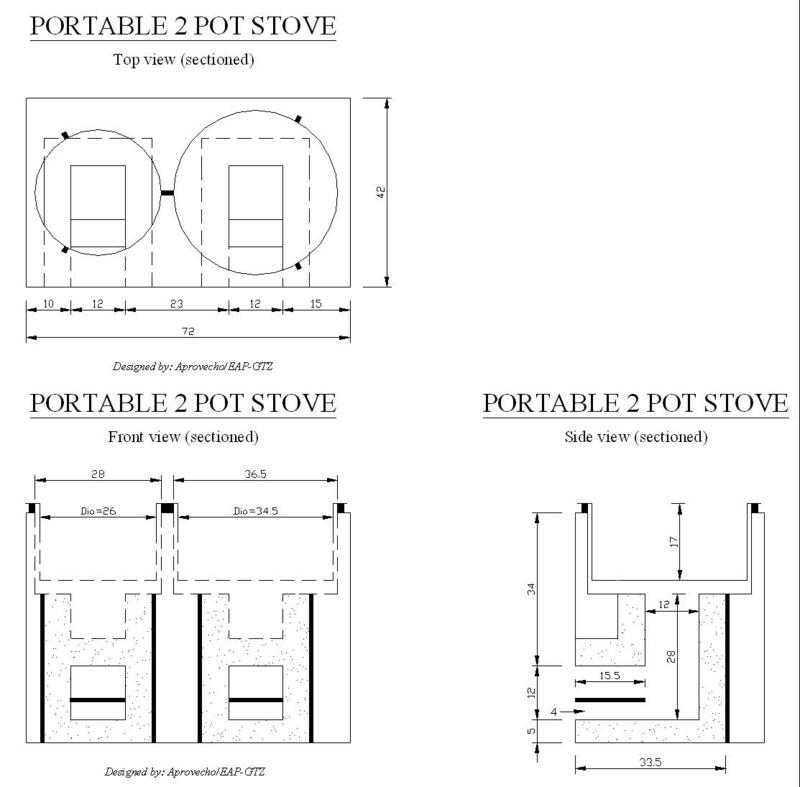 The primary Rocket stove principle feature is using a hot, insulated, vertical chimney within the stove body that increases draft. 5.) Do not allow too much or too little air to enter the combustion chamber. We strive to have stoichiometric (chemically ideal) combustion: in practice there should be the minimum excess of air supporting clean burning. 6.) The cross sectional area (perpendicular to the flow) of the combustion chamber should be sized within the range of power level of the stove. Experience has shown that roughly twenty-five square inches will suffice for home use (12 cm in diameter or 10 cm square). Commercial size is larger and depends on usage. 7.) Elevate the fuel and distribute airflow around the fuel surfaces. When burning sticks of wood, it is best to have several sticks close together, not touching, leaving air spaces between them. Particle fuels should be arranged on a grate. 8.) Arrange the fuel so that air largely flows through the glowing coals. Too much air passing above the coals cools the flames and condenses oil vapors. 9.) Throughout the stove, any place where hot gases flow, insulate from the higher mass of the stove body, only exposing pots, etc. to direct heat. 10.) Transfer the heat efficiently by making the gaps as narrow as possible between the insulation covering the stove body and surfaces to be heated but do this without choking the fire. Estimate the size of the gap by keeping the cross sectional area of the flow of hot flue gases constant. EXCEPTION: When using a external chimney or fan the gaps can be substantially reduced as long as adequate space has been left at the top of the internal short chimney for the gasses to turn smoothly and distribute evenly. This is tapering of the manifold. In a common domestic griddle stove with external chimney, the gap under the griddle can be reduced to about one 12mm for optimum heat transfer.